This Autumn seems to be a very good year for sweet chestnuts. Well, at least our local woods, Ruislip woods, have provided a lot of really good quality sweet chestnuts this year. Collecting chestnuts is fun and we got so many. I made 2 jam jars and one ice cream tub of chestnut puree. So, I have been trying to be clever using the lovely creamy sweet chestnut puree. Here is one of my successful attempts to enjoy this Autumn flavour. 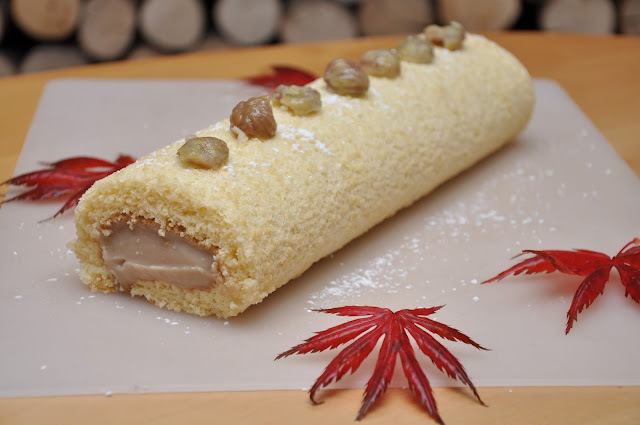 I spread too much puree on the sponge and, unfortunately, I could not Swiss-roll it. Can I still call it "Swiss roll"? Well, let say it's "Ruislip roll." Preheat the oven to 200C/400F/Gas 6. Grease and line a 23cm x 30cm/9in x 12in Swiss roll tin. Whisk the eggs and sugar in a bowl until pale and fluffy. Fold in the flour and spoon the mixture into the tin. Bake in the oven for 7-10 minutes, or until light and springy to the touch. Remove from the oven and turn the sponge out onto another piece of greaseproof paper. For the filling, spread the sweet chestnut puree (click for the recipe) onto the sponge, leaving a small gap around the edges.